As the 2018-19 Superliga season got underway, I decided it would be a good idea to make a couple of predictions. Let’s just say, I was more incorrect than not. Thank goodness no one remembers those predictions, even though I am about to remind you of all of them. Now is my chance to right my wrongs and take a second shot at not looking like quite as much of an idiot. After 15 of the 25 matches have been played, we have a much better idea of what to expect in the second half of the season, but at the end of the day, this is still Argentine football, and no one ever really knows what’s going to happen. But either way, it’s good to have the Superliga and all of its weirdness back again. No shock here, the current team sitting at the top of the table is the favorite to win the title. Racing currently hold a three-point lead over Defensa y Justicia who sit in second. While recent history shows us that DyJ are not to be underestimated and can beat anyone on any given day, Racing has shown little evidence that they plan to slow down and relinquish their lead to anyone. Racing added Darío Cvitanich which gives them another proven goal scorer up front. As mentioned, just three points behind the front runners, El Halcón appears to be ready to give Racing a title fight. For the impartial fan, this is all we could hope for. With Boca having run away with the title the last two seasons, having a proper title race could be just the thing we need to keep us interested during these final 10 matches. The championship could come down to the final match of the season – Racing vs Defensa y Justicia. Look, when you’re wrong you’re wrong, and this pick was absolutely wrong. Zárate has yet to find his footing at Boca and has only scored one goal. The race for top goal scorer appeared to be a battle that would take place in Avellaneda. Both Lisandro López (Racing) and Emmanuel Gigliotti (Independiente) were setting the pace with 12 goals each. Now that El Puma has left El Rojo for Toluca in Mexico, López appears to be the obvious pick. His pace has him four goals ahead of Luis Rodriguez in second. With El Pulga’s transfer to Colón, it could take him some time to get into his regular goal scoring form. Wait, what am I saying, it’s El Pulga Rodriguez, he’ll score a hattrick in his first match and silence everyone who questioned his sudden departure. That being said, Lisandro López should continue to score goals for the league leaders and finish the season at the top of the goal scoring table. While the pick was wrong, I stand behind my logic of selecting Juanfer Quintero. Who am I to question Marcelo Gallardo, but I for one was completely lost as to why the Colombian spent so much time on the bench. When he is in the match, he is almost always the best player on the pitch – something we all saw clearly in the Copa Libertadores finals. Quintero could still string together plenty of assists, but with Lisandro López and the addition of Darío Cvitanich for Racing, I believe Augusto Solari will have a plethora of opportunities to add to his current assist total of three. He sits just one spot behind Guillermo Acosta, now of Lanús, but I expect Racing to score more goals than El Granate which should help Solari bolster his assist numbers. River is currently eight points off the pace, even though they have two games in hand, their last few matches hasn’t filled their fans with much confidence that they will contend for a Libertadores spot. Independiente, well, if you know what is going on with Ariel Holan and El Rojo, let me know because they have been nothing short of a mystery during the transfer window. Racing is expected to win the title and Defensa y Justicia should give them a fight – that fills two of the four spots. Vélez has the perfect mix of an excellent manager and young players who can play his style of football. Gustavo Alfaro is a solid manager, but it’s not a far stretch to imagine Boca regressing significantly. That being said, Boca sit just three points off the pace and have two matches in hand and still claim one of the best squads in Argentina. While it could happen, it’s hard to imagine a scenario where neither Boca nor River finish in the top four, but if it was to happen, this could be the year. You can’t be much more of a surprise than being a 17-year old kid who has never even played for the reserves, suddenly gets called up to the first team, is the standout of the squad, and is now being included in Argentina’s sub-20 squad for the Sudamericano tournament. The blond-haired youngster has already been the surprise star and it’s hard to imagine anyone topping what he’s already done. Six months ago, rumors had Pavón linked with Arsenal and Barcelona, now its clubs from the bottom half of the EPL table that appear to be interested. Pavón looked set to be the next big thing in Argentine football, and while that could still happen, he has taken a significant step backwards during the first half of the season. Currently Tigre, San Martín de Tucumán, Patronato, and Belgrano sit in the relegation zone. San Martín de Tucumán have a significant advantage that if they start winning, they can improve their average much quicker than the other sides. And during the last month of the season, they looked like they were starting to settle into the first division. 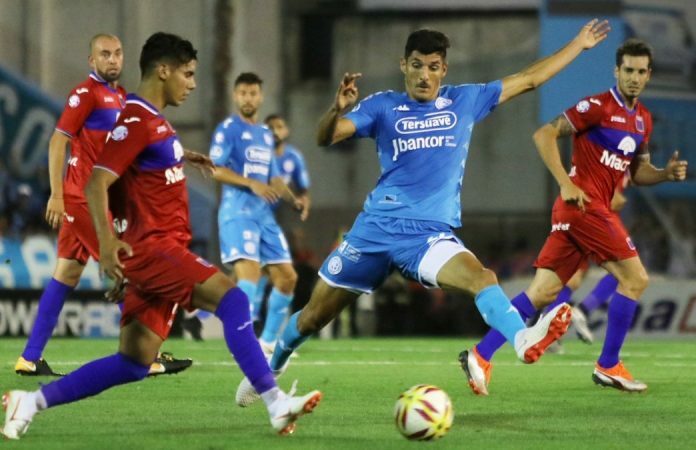 Belgrano has already brought in eight new players, while almost all of them are upgrades, the loss of Matías Suárez seems like it all but spells their demise. San Martín de San Juan and Patronato also did not make enough additions to really move the needle. The only wrench that could be thrown into this battle is Argentinos Juniors who have been the worst team in the Superliga this season. They have only two seasons counting towards their promedios, which also means that if they continue to lose, they could fall into the relegation zone quickly. Jimmy lived in Córdoba, Argentina as a teenager and is still an active Socio for his beloved club, Belgrano. He currently lives in Seattle, WA and runs the Belgrano – English twitter account.